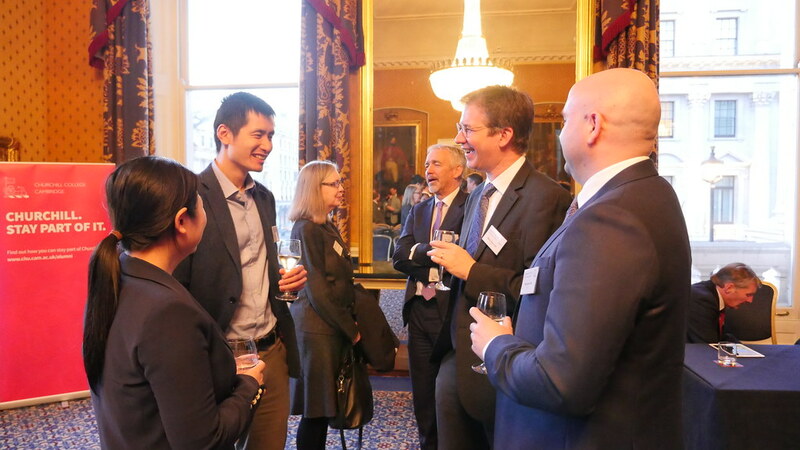 It was fantastic to see so many alumni at the second meeting of the Churchill Business Network at the end of April at the Institute of Directors on Pall Mall. We heard from three alumni representing different generations of Churchillians: Simon Henry (U79), James Butler (U66) and Chris Campbell (U08). Simon Henry spoke about new challenges facing anyone involved with corporate governance and the implications of changes in the equity markets and financial regulation. Drawing on his experience from sitting on the board of Shell, where he was CFO, he spoke of the distorting effect of equity markets on some longer term business decisions. James Butler spoke about leadership in the context of the Lloyd’s names crisis of the late 1980s. He was on the board at this time when individuals (known as ‘names’) who had borne the risk by underwriting the insurance wanted to claim they were missold their investments, the subject of litigation until fairly recently. James Butler is currently a non-executive director of Zurich Insurance. Chris Campbell, who is currently working at JP Morgan, spoke about the value of the business network to him as a recent graduate and how he still has a strong network of Churchill friends – friendships that have been instrumental in people developing new career paths. It was great to have his perspective as a young alumnus. We are grateful to Development Board member Greg Lock for sponsoring the event and the business network. There was time at the end of the event for questions directly to the speakers and networking drinks. We plan to hold the next event in the autumn of 2018 in central London and would love to see more students and alumni join us. If you would like to join the Churchill Business Network mailing list or could help with securing a venue please contact the Alumni Office.